Albert Baggetta is a teacher of English and a professional guitarist who has an avid interest in programming the Atari ST. He resides in Agawam, Massachusetts with his wife, Beverly, and his two children, Angela and Michael. He can be found wandering the ST-Log and ANALOG Atari SIGs on DELPHI. picture yourself as a highly trained, underpaid detective on assignment in the past, rubbing elbows with some of William Shakespeare's most prominent characters. (You know, those strange creatures that once inhabited your readings in Sophomore English class.) Imagine yourself lurking in the damp, stone corridors of a musty castle, trying to avoid trapdoors and fiends who try to stifle you. Envision yourself working against time, aggravated by the world around you, hoping to solve some of the most mysterious cases you have ever encountered. Ah, yes, the romantic life of a public investigator. If you have the imagination (and an Atari ST computer with color monitor) there is a world of fantasy awaiting you in the game of Drama-cide. First of all, you will have to dig out and dust off that little disk that came with your computer, plug it into your disk drive and boot-up the ST BASIC language. When you get the "Ok" prompt, type in (checking your work with ST-Check, found elsewhere in this issue), save and then run the program that accompanies this article; or if you already have it on disk, just type LOAD DRAMA, hit Return and wait for the "Ok" prompt; then type RUN, and hit Return. You will see a colorful title and be introduced to the ominous success tune. 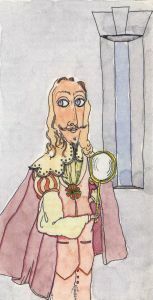 After a few seconds you will be informed of the game's scenario: You are a medieval detective (if there ever was such a thing) called in to solve a crime of murder at the king's castle. (Turn on that imagination.) 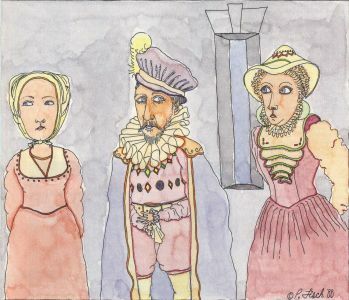 It seems that the king invited a group of William Shakespeare's most distinguished characters to a little soiree. During the evening, however, a murder was committed and all of the guests have vowed to clam up unless you, the investigator, guess what is going on. When the investigation actually begins, you will be able to guess at four elements: the murderer (remember it could also be suicide), the victim, the weapon used in the murder, and the room in which the murder took place. If you press any key here, you will be presented with the layout of the King's small but comfortable castle Each labeled room will contain the following elements: two characters (each is a potential murderer and/or victim) and a weapon. After examining the castle's contents, press any key and you will be taken to the main hall. This will become your headquarters. From this foyer you may enter all of the rooms. Your display at this time will show the following information. At the top of the screen there is a title bar which displays your current score for the case you are working on, the number of the case (there are ten cases numbered zero to nine) and the title of the game. 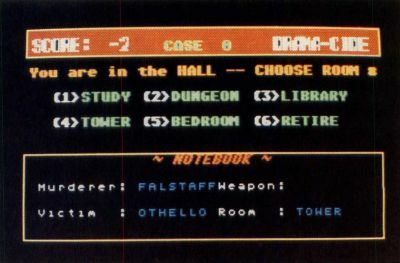 The middle of the screen will inform you of your present location and give a list of the five rooms in the castle (Study, Dungeon, Library, Tower and Bedroom), each numbered for easy access. The bottom of the screen shows your notebook. Being an efficient detective you will want to keep notes of your discoveries. As you unveil each element related to the crime, it will be automatically entered in your notebook. When the notebook is filled, you have successfully solved the crime, and you will be duly rewarded for your services as explained below. Let's go to one of the rooms to see how the game is played. Press a number key (one through five) to go to one of the rooms (number six allows you to abort the game); you will not have to press Return. After a second or two of screen set up, you will find yourself in the respective room. The number of the room is displayed in the lower right corner of the screen. The screen also indicates which room you have entered, who the suspects/victims are, and which weapon is present in the room. Notice that every time you enter the room some of the characteristics of the room might have changed. The weapon, for example, might be in a new location or gone entirely from the room. Because of some unexplainable force, you will not be able to know if either of the characters in the room is alive or dead at this time, whether this was the murder room, and whether the weapon present was indeed the murder weapon. You must inquire to get this information. Underneath the weapon statement, you will see the prompt, "QUERY?". This is where you inquire. To find out if any of the room elements is involved in the crime, just type in the suspected name, room or weapon and press Return. If you are right, the ominous tune will play, and you will be told of your accomplishment. You will not be allowed to guess any element not in the room, unless it was there before; and you will not be allowed to offer your guess in lowercase letters, so keep these two caveats in mind while playing the game. The maximum number of guesses per room on each visit will be four, but you might not get four guesses because of various interruptions. For example, you might be called away for help or an important call might come in from the head office. Sometimes you are forcibly or accidentally taken from the room. Often you will even be called for lunch. After all, even a detective has to eat. You may, of course, always come back to the room to continue your investigation if necessary. If you find that you have no further need to be in a room, just type one of the room numbers (you'll have to remember these on your own) and press Return. This will immediately take you to that room. If you enter H, you will go to the hall. And so it goes until you have correctly guessed all of the crime elements—or until disaster strikes! Since this is an adventure game of sorts, there has to be some kind of conflict involving you. So be aware that there is imminent danger built into the game. At times, somewhere in the recesses of the castle, someone (maybe the murderer) sets a ghastly "Bear Grease bomb." There is nothing more devastating than this weapon. When it explodes, it not only kills you, but it destroys the entire castle and all its contents. Needless to say, you will have lost the case. The bomb won't come as any surprise, though. When you find a ticking message, it means that the bomb has been set (you will be reminded of this when in the hall), and you must work feverishly to solve the crime. From this point on, you are in the hands of fate. With some luck, however, you might enter the room which contains the bomb. At this point, you will automatically disarm it and again breathe easily—until the next one is set. Drama-cide is actually one big game of chance. It is a dramatic game of roulette, geared to blow you away if Lady Luck is not on your side. Each element of the crime is chosen at random. In fact, there are 13 random statements controlling the establishment of each case. In spite of this, you are in control of your own destiny; it is your decisions that will determine if you turn out to be a hero or a dead detective. The good detective will notice some clues that will help speed up the investigation. When you enter a room, read the information on the screen carefully and you will discover certain patterns and expressions that will lead you to some of the involved elements. They are not always reliable but under certain conditions they will reveal important clues which can show the way to success. If a character is identified as sleeping, for example, it might mean he or she is dead. Could this be the victim or is the character just a heavy sleeper? With the bomb ticking away and your life hanging by a thread, a clue of this sort could be very important. Scoring is important as a reward for the weary detective Generally, points are given or subtracted as follows: +10 points for each element discovered (the murderer/victim, weapon, room); +20 points for disarming the bomb; -2 points for a wrong guess; and -2 points for interruptions. Bonus Points: Sometimes, on examination of the castle plan, fate will deal you a hand and tell you which room the murder was committed in. You will be given ten points then, and when you formally guess at the room, you will be granted another ten points. Wow! Talk about generous. Should you solve the case, you will be taken to the Modus Operandi screen, which reveals the who, when, why, how and where of the murder in context. There are five of these plots randomly placed here. Each is imbued with differences in the elements of the crime. Four of these motives are designed for the murderer and victims as separate characters. The fifth plot will appear if the crime is one of suicide. This motive screen will also display a verbal reward or reprimand, current score, and the option of continuing with another case or leaving the game. As each case is solved you will be presented with a case-scoring screen. Here you will be able to compare your score with the previous cases (played by you or someone else), and you will see the total score for all games played up to that point—detectives having bad luck might end up with a minus score. Drama-cide is only set up for ten cases at a time. If you manage to investigate all ten in one sitting, you will be given the total score and the chance to start all over again. It was interesting working on this program because I learned a lot about ST BASIC, especially its hidden powers to access the VDI and AES. It also gave me a chance to play with some simple artificial intelligence ideas. Because of the random changes in the text, the machine seems to be the detective's antagonist. Also notice how the program takes care of matching pronouns with their antecedents and gender. For the programmer I have added a little secret code, a little trick that can add a whole new dimension to the game if discovered—a sort of mystery in the mystery. So all you Sherlocks put your caps on, and see if you can solve the mysteries of Drama-cide.